Last week, we welcomed 215 new students, 92 part-time students, and 26 transfer students to the school. Among this year’s class, we have 13 students who hold advanced degrees, including 2 Ph.D.s (French Literature and Chemistry) and 1 Doctor of Pharmacy. The entering class comes from 24 states and 120 colleges and universities, studying abroad in over 22 countries, and collectively speaking 14 languages. Ten students joining us this year graduated with perfect 4.0 grade point averages from their undergraduate programs. Members of the class have been reporters, dancers, Peace Corps workers, professional athletes, and have served in our nation’s military. Special thanks to Illinois Supreme Court Justice Anne Burke ‘83 for administering the oath of professionalism to our incoming 1L’s. The returning students arrived at Chicago-Kent not only to find a wonderful new class of students, but to see Iustitiam Servaverunt, a new sculpture on the first floor honoring the many alums who have served as courtroom judges. The unveiling ceremony and reception will take place on September 18, 2005, from 5:30 PM – 7:00 PM. We invite you to join us at the law school, and salute those who have served and are serving the judiciary with distinction. Click here to RSVP or phone the Office of Alumni Relations at (312) 906-5240. Finally, each fall we ask you to consider fellow alumni or members of the legal community who merit recognition for one of the 2006 Chicago-Kent Alumni Awards. We are currently seeking your nominations for the Distinguished Service Award, the Professional Achievement Award, the Young Alumnus Award, and the Honorable Abraham Lincoln Marovitz Public Service Award. Please review the criteria and submit your nominations soon, as the nomination deadline is this Friday, September 8. I wish you all the best and look forward to seeing you at one of our Chicago-Kent events this year. 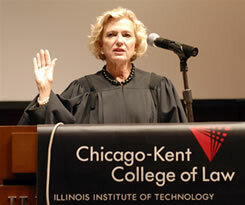 Illinois Supreme Court Justice Anne Burke '83 administers the oath of professionalism to incoming first year students at Chicago-Kent. at the unveiling ceremony and reception of our judges’ wall. Please respond with your plans to attend no later than September 13. We have a fantastic Reunion planned for graduates from the classes of 1956, 1961, 1966, 1971, 1976, 1981, 1986, 1991, 1996 and 2001. Invitations are in the mail, so look for yours, soon! We are privilieged to count you among our alumni! We are pleased to have hosted two outstanding summer events with a fantastic showing of alumni and guests, at both. On August 3, the law school hosted its annual Donor Recognition Dinner at The Field Museum with cocktails and dinner in Stanley Field Hall followed by a private viewing of Tutankhamun and the Golden Age of the Pharaohs. With over 200 attendees present to honor our alumni and friends, and sensational time was had by all. Chicago-Kent alumni headed to the South Side for this year’s Alumni Baseball Outing to cheer on the 2005 World Champion Chicago White Sox. While the Sox had a rough night as the Kansas City Royals took the game with a final score of 10-4, nearly 200 alumni and guests had a great time enjoying the party as they gathered in indoor and outdoor seating areas. Thanks to all who came out and supported us! Photos from both events can be viewed by visiting our Alumni Photo Album.